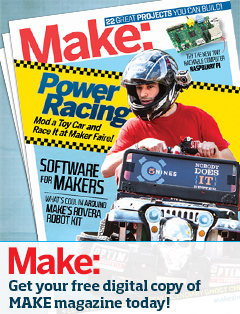 Mark Your Calendars for the 2013 Mini Maker Faire! We’re excited to partner with Washtenaw Community College to host our fifth annual Ann Arbor Mini Maker Faire. Mark your calendars for Saturday, June 8, 2013! We’ll start at 10 am and play until 5 pm. We’ll be hosting this year’s Mini Maker Faire at WCC’s Morris Lawrence building, with lots of space and electricity for the types of activities you expect as well as space for new activities, like featured speakers. We’re also partnering with a local artist to provide a fresh new logo and look for our posters. Stay tuned to the blog for the Call for Makers, general invitation information, and additional details. 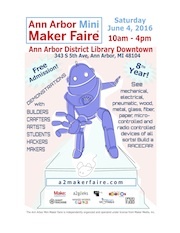 What can you expect to see and do at this year’s Ann Arbor Mini Maker Faire? Any of these activities can be featured at the Faire.